The MDtest is a professional, compact, portable analyzer, designed to verify the electrical safety of medical devices. The MDtest has an extraordinary wide scope of use thanks to a lot of optional accessories, which enable testing practically any portable or hard-wired, one-phase or three-phase medical device. 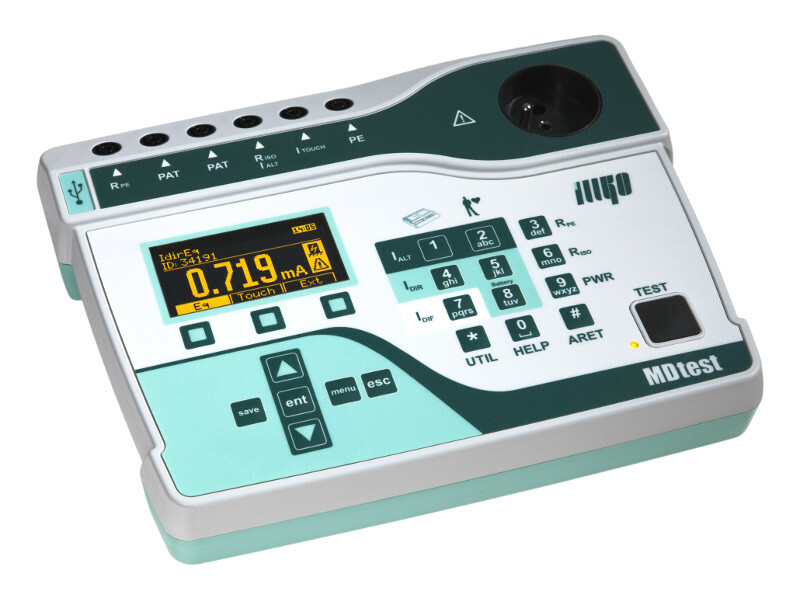 - The MDtest instrument is designed to verify the safety of electrical appliances and medical devices in general. The MDtest meets the requirements of EN 62353 and EN 60601 (partially), including the required input charakteristics. - Some leakage current measuremets shall be done at the SFC (Single Fault Condition) - the Neutral or PE conductor is interrupted. - Measurement of PE current during operation and differential leakage current of three-phase portable appliance by means of optional adapters. - Some measurements are also possible if the MDtest is connected to the IT mains. - Test results can be saved under an ID number which is unequivocally assigned to the respective DUT. - The test structures created at the PC can be loaded into the MDtest. - Measurement data saved to the test instrument can be imported to ILLKO Studio software via the USB port and reports can be generated. - Create user - defined test sequences. 1) When measuring patient leakage current and higher resolution (5 digits) is set. 2) Three-phase adapter error has to be considered additionally. 3) Current clamp error has to be considered additionally. The set includes all accessories necessary for testing 230 V / 50 or 60 Hz appliances equipped with a movable power supply cord.